Lauren Winsor is currently studying at Wellesley College through the Killam Fellowships Program. Prior to her semester in the States, Lauren studied psychology at Newfoundland's Memorial University, where she has contributed to multiple research studies. A Rhodes Scholarship Finalist, Lauren aspires to become a practicing physician and research scientist, focusing on mental health and health promotion. In the article below, Lauren reminisces about the highlights of her Atlantis Research Fellowship in Barcelos, Portugal. As a pre-med student in Canada and the United States, it can be difficult to shadow doctors. Most shadowing placements are given to medical students and resident physicians, leaving few opportunities for pre-med students who want to experience clinical and surgical shadowing first-hand. Riverside view of Barcelos on a sunny day: perfect for fishing! However, through The Atlantis Fellowship, I found a solution to this struggle: clinical and surgical shadowing placements in Europe and South America. At first, it sounded too good to be true. 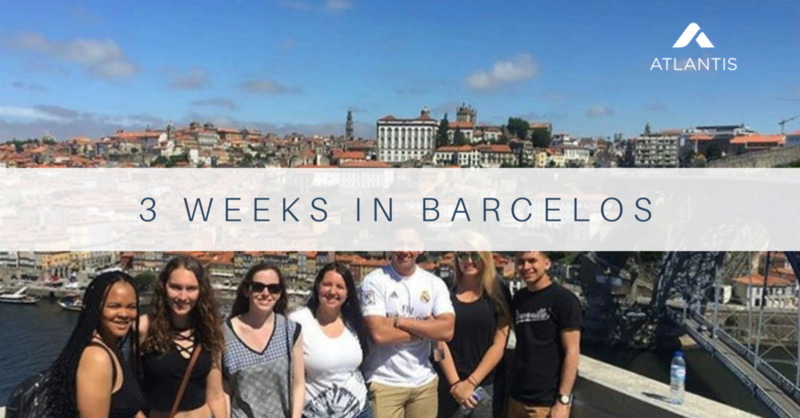 However, after I applied and was accepted to the program last summer, I spent nearly a month shadowing doctors at Hospital Santa Maria Maior in Barcelos, Portugal. Over the course of the three week fellowship, I made some amazing friends and had so many incredible experiences that will help inform my studies when I begin medical school this fall. Below I will share a few of the highlights. Over the course of the three week fellowship, I made some amazing friends and had so many incredible experiences that will help inform my studies when I begin medical school this fall. At Hospital Santa Maria Maior, our shadowing program was arranged by our wonderful site leader Bernardo and a dedicated group of final-year medical students who served as our guides on each of our week-long rotations. My first rotation was with internal medicine. In this rotation, I encountered very interesting cases that highlighted some of the public health issues facing rural populations in Portugal. When discussing these issues with my medical student guide – Daniel – I was struck by their similarities to the public health concerns facing Canada, and my province, Newfoundland and Labrador, in particular. Both regions have rapidly aging and large rural populations and must adapt their healthcare systems to meet the needs of these two patient demographics. I will be able to incorporate the lessons that I learned about rural medicine and treating aging populations in Portugal into my clinical rotations in Newfoundland and Labrador’s rural communities following my first year of medical school. My province is connected to Portugal by more than aging populations and a large rural patient base, however. For hundreds of years, Portuguese fleets fished off of the coast of Newfoundland in an area called the Grand Banks. In fact, my father used to watch fishermen from the Portuguese White Fleet (named as such because all of their ships were painted white) play soccer by the edge of St. John’s Harbour when he was growing up. While Portuguese fishing on the Grand Banks ended before I was born, I had the opportunity to see the hospital ship that served the White Fleet on one of our Wednesday excursions to Viana do Castelo, where the ship is docked. Having the opportunity to experience part of the shared history of Newfoundland and Labrador and Portugal was incredible, and it served as a reminder of just how connected the world is today. On that note, Portugal itself is well connected, and it was thrilling to be able to experience multiple regions of the country, and even Spain, during my Fellowship. My group of Atlantis co-fellows was relatively small, which made it easy for us to travel and explore together. On weekly excursions to Porto, Viana do Castelo, Braga and Guimarães, we learned about the history of Portugal and explored some of the famous landmarks in each municipality. Beyond these scheduled trips, my friends and I made several of our own weekend excursions to see more of what Portugal had to offer. 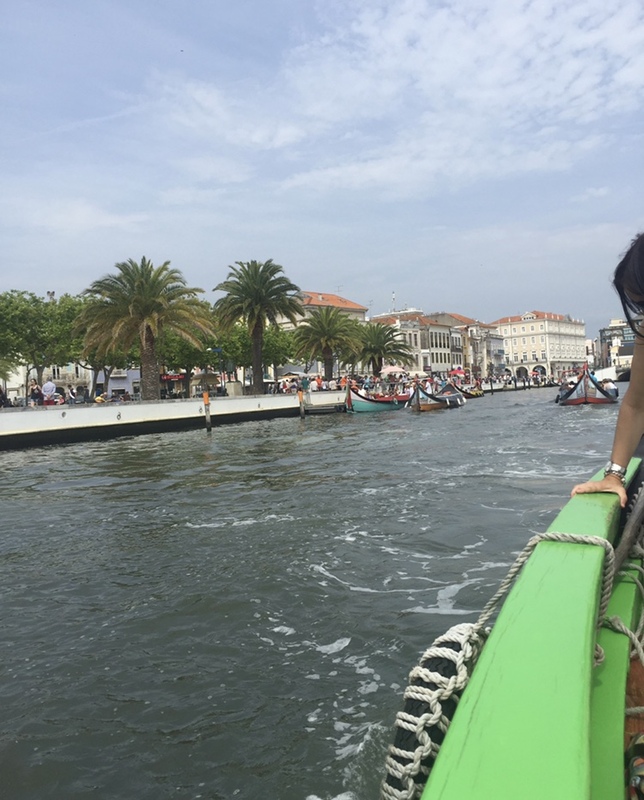 We explored Barcelos, took a canal ride in Aveiro (this town is called the “Venice of Portugal” because of its canal system), Porto and Gaia, Lisbon, Braga, and even Barcelona, Spain. These adventures helped form lasting friendships among our shadowing cohort and another group that was shadowing at a hospital in Viana do Castelo. We are still in contact almost a year later, and I think that we will continue to be friends for a long time to come. In the second and third week of our shadowing placement, I rotated between several specialties: oncology, pediatrics, pediatric emergency medicine, and surgery. I have always been curious about these specialities, and it was very exciting to be able to experience them firsthand. Further, considering the time I spent in the hospital as a child, it was especially eye-opening to experience patient care from the perspective of the physician. When I was four years old, I was diagnosed with Multiple Endocrine Neoplasia type 2A (MEN2A) – a genetic condition that causes tumours in various endocrine glands. The tumours associated with MEN2A tend to develop early in life, and I had a total thyroidectomy at age six in order to prevent the eventual development of thyroid cancer. It was at this point that I decided that I wanted to pursue a career in medicine. I loved and admired the doctors who cared for me as I recovered from surgery, and I knew that I wanted to spend my life helping others in a similar manner. It was fascinating to see the mechanics of the surgery that has allowed me to live a healthy life, and it was hilarious to see the surgeon’s reaction when she noticed the scar on my neck and realized that I had undergone the same surgery that she had just performed! While shadowing, I had the opportunity to leave my patient role and step vicariously into the caregiver role. Moreover, during the final week of shadowing, I was able to watch two thyroidectomies during my surgical rotation. It was fascinating to see the mechanics of the surgery that has allowed me to live a healthy life, and it was hilarious to see the surgeon’s reaction when she noticed the scar on my neck and realized that I had undergone the same surgery that she had just performed! This experience left me with a sense of closure, as if my life had come full circle in a short fifteen years to leave me at a point where I can be comfortable with my diagnosis, and everything that has come along with it. Overall, my shadowing experience with Atlantis was absolutely incredible. It was full of learning, exploring, and bonding with life-long friends – fellow pre-meds and Portuguese doctors alike. If you would like to participate in your own version of this amazing, adventurous learning experience, head to the Atlantis website and apply today!